3-8 p.m. Greetings, Friends! Read on…. What About Those Shuttle Buses? 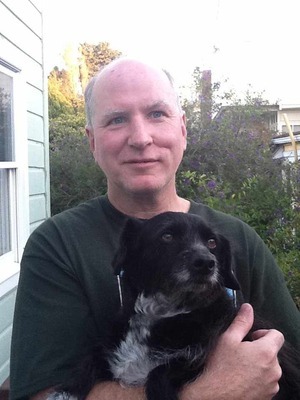 Chris Faust is doggedly dedicated to his neighborhood, and the credit for that goes in large part to, well, to his dog. It was Grover, Faust’s 5-year-old terrier border collie mix, who introduced the 30thStreet resident to neighbors he’d never met and causes he’d never considered. Faust joined the other “regulars” at the run in the evenings and enjoyed socializing and talking politics, but the group really came together when the necessity of an improved dog run was called into question during the center’s remodel. “I wasn’t political at the time, but I realized we had to spring into action,” he said. Dog lovers made their voices heard, and the new dog run moved forward with the department’s plan, the L-shaped run with the new Day Street entrance. Faust and fellow dog owner Pete Woulfe visited City Hall and attended meetings to follow the work’s progress. Even after work was complete, they pushed for a high-quality play surface, benches and clean water in the drinking fountains. They started Friends of Upper Noe Dog Owners Group—FUNDOG, to maintain the run and advocate for dogs and their guardians. They take the garbage bins out twice a week, sweep and rake the run, and of course pick up dog messes left by less conscientious visitors. Neighbors and visitors have complimented FUNDOG, but that’s not the payoff, Faust said. “Dog parks are community centers,” he said. The Joby’s Run community goes beyond neighborhood bounds and attracts canines and their owners from all over the city. Woulfe, for example, does not even live in Noe Valley, Faust said. Because many owners congregate in the evenings and at night after work, they also serve as a deterrent to vandals, calling the police when they see mischief on the basketball court, for example. And when graffiti does appear, Faust will paint over it himself if the city is delayed. Faust is also active in his Neighborhood Watch group, and he is a trained member of the Neighborhood Emergency Response Team. Friends of Noe Valley Recreation Center owe Grover a bone. “He’s totally made a difference in how I treat my neighborhood,” Faust said. Upper Noe’s toddler classes may have long waitlists, but the two remaining on-site summer camps for tweens have plenty of openings, says Program Coordinator Levi Johnson. In the June camp sessions, 8- to 12-year-olds have thrown themselves into urban-style art and a wide range of sports. Spray paint in hand, the kids made a graffiti mural on butcher paper, and they can look forward to mask-making and other paper crafts, Johnson said. The kids play less well known sports like circle football (a European-imported soccer-football combination game) and indoor street hockey alongside old favorites. “They all love the kickball and the dodgeball,” Johnson said. An urban farming component to the camp has been surprisingly popular, Johnson said. This year two instructors from Seattle have planted gardens with the students, putting special emphasis on urban adaptations, like growing potatoes up a pole to make best use of space. Two sessions remain: July 5 to 15 and July 18 to 29, each costing $244. Financial aid is available and can cover at least half of the tuition and sometimes all of it, he said. Camp runs from 9 a.m. to 3 p.m., with extended care available from 8:30 a.m. to 5:30 p.m. Call 415-970-8061 for more information. Upper Noe is also the base for off-site summer camps for tweens—surf camp and skateboarding/BMX/surf camp—but both of those are full. Alison Faith Levy, formerly “Sippy Alison” of beloved Bay Area psychedelic kid-rockers The Sippy Cups, returns for another Big Time Tot Rock Saturday, July 9, 9 to 11 a.m. in Upper Noe Recreation Center’s auditorium. Levy has written a slew of new music to fuel her regular Wednesday morning song and storytime at Phoenix Books on 24th Street. She expresses her freewheeling rock n’ roll energy through simple acoustic guitar and piano tunes, bringing the kids to their feet in a raucous good time. She’ll round out the concert with some of her most popular Sippy Cups songs like “Magic Toast” and “The Jellyfish,” plus classic kids songs and favorites from rock, Country & Western—even some show tunes. 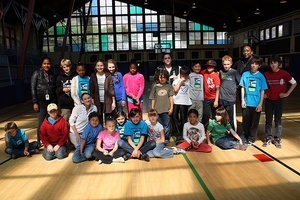 The Friends of Noe Valley Recreation Center has been named a “park group of the year” by the Neighborhood Parks Council in recognition of its advocacy and stewardship work. NPC, a nonprofit park advocacy organization that works to link department policy to research and public input, will recognize 11 volunteers, park group and coalition members for bringing their communities together to revitalize San Francisco’s open spaces. That means you and the difference you make by being actively involved in improving Upper Noe Recreation Center. Thanks! Upper Noe Rec Center staff are easily recognized now that they’ve donned their snazzy department-issued t-shirts stamped STAFF on the back. The shirts showed up at the beginning of June, just before summer camp started, said Alvin Torres, a recreation leader. The department’s logo is colored blue—the color associated with summer camps—but Torres thinks the shirts will stay passed summer. “It seems like a good idea!” he said. Renovations of Dolores Park playground have begun and aren’t scheduled to finish until February, 2012. Bring the kids to Upper Noe instead. What we lack in jaw-dropping view we make up for in spacious indoor and outdoor play areas. Consult the updated Hours section in the lefthand sidebar for indoor free time. Visit Friends of Dolores Park Playground to learn more about the renovation or to sign up for a newsletter to receive progress updates. Thank you, Noe Valley Santa! Friends of Noe Valley Recreation Center and the tots who play inside would like to thank those who donated the new and gently used toys. Please call the office at 970-8061. The form is available on our website and at the center. Please either drop it off or mail it to: Front Desk, UNRC, 295 Day Street, SF, 94131. Tabling on July 9 from 9 a.m. to noon. This opportunity is ongoing. We need volunteers to tell people about our organization during our free family concerts in the Auditorium the second Saturday of each month: July 9, August 13 and September 10. Come meet your friends and neighbors and let them know about the Friends of Noe Valley Recreation Center! Please contact Molly, molly (at) noevalleyreccenter.com, or Kate, kate (at) noevalleyreccenter.com. Ladybug Gardeners are on hiatus until September for lack of volunteers. Please join us in the Fall. The city hires a gardener to assist volunteers, so we need a minimum of seven volunteers each session. If we don’t get enough volunteers, our program will be discontinued. Wednesday, July 27, 7 p.m.